There is nothing to compare to the total immersion of snow bound places like Canada’s Lac des Bouleaux for riding in the deep winter months. 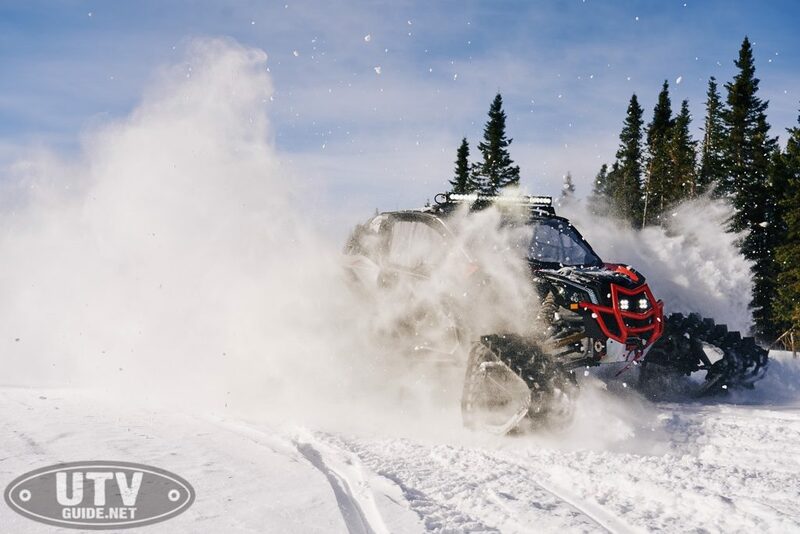 This is where the Can-Am PAC (Parts Accessories Clothing) team decided to introduce journalists to their latest snow tracks. 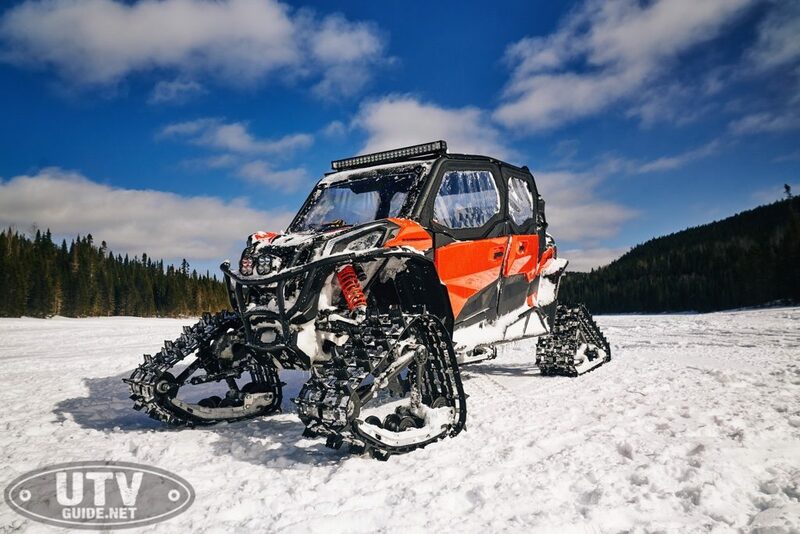 The Apache Back Country and Back Country LT or Long Track was installed on several different side by sides including the Maverick X3 Xrs and Xds as well as the Defender HD10. 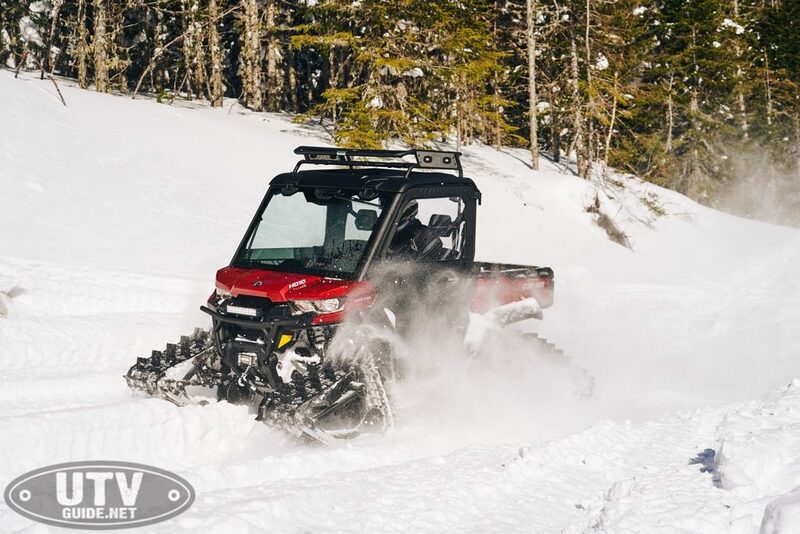 We also had a 4-seat Maverick Sport which utilized the Back Country tracks to test the traction and floatation of this new snow only accessory for your SXS. 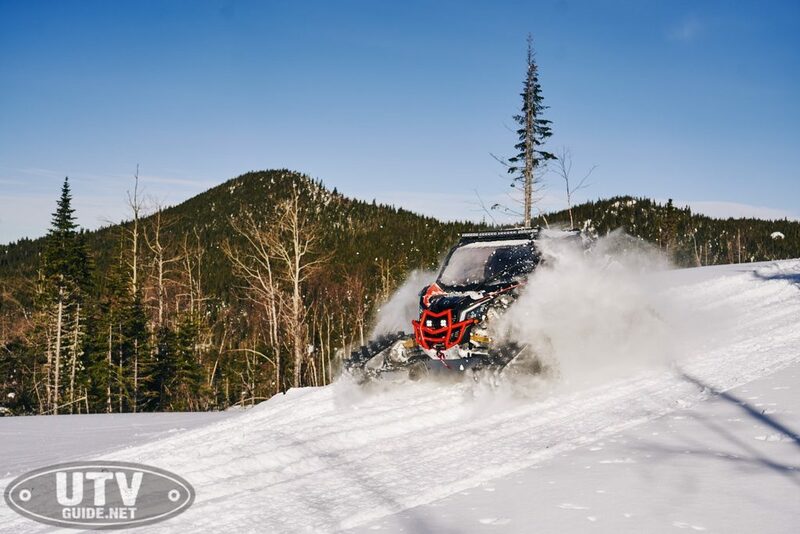 You might already recognize the Can-Am Apache brand as their All-Season tracks have been on the market for many years. These tracks are made for a variety of terrains including snow and mud. 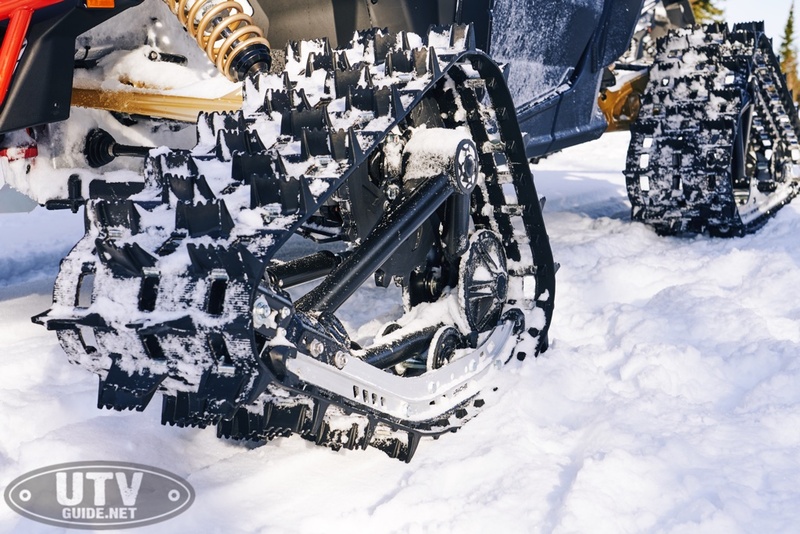 However, the new Apache Back Country and Back Country LT tracks are made specifically for the deep powder snow. The 2-inch lug and the 3-inch pitch increase gives you a more universal and uncompromised traction as well as flotation. What is very unique to this new set of tracks is the slider system. Departing from the traditional Apache all-season track the Back Country uses an aluminum rail or slider for more contact patch. This is actually the same track that a Ski-Doo Summit snowmobile uses. 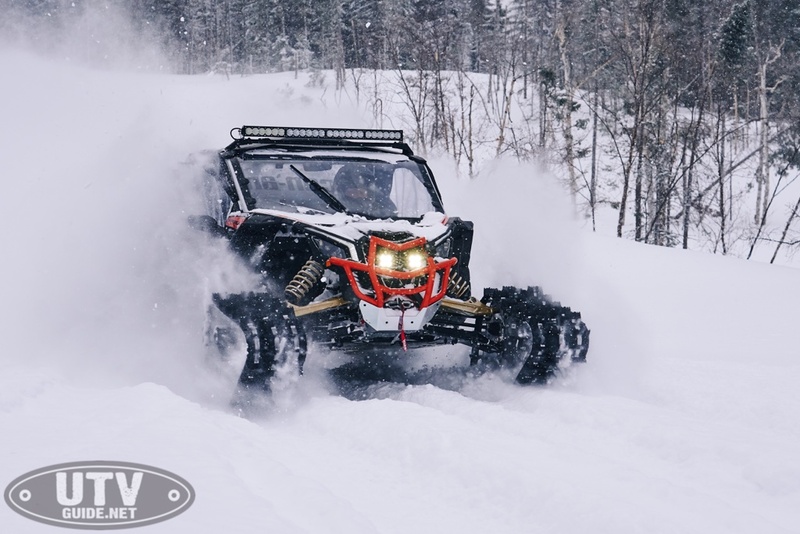 According to Can-Am there are four items needed to achieve maximum fun and ability in the deep back country snow. 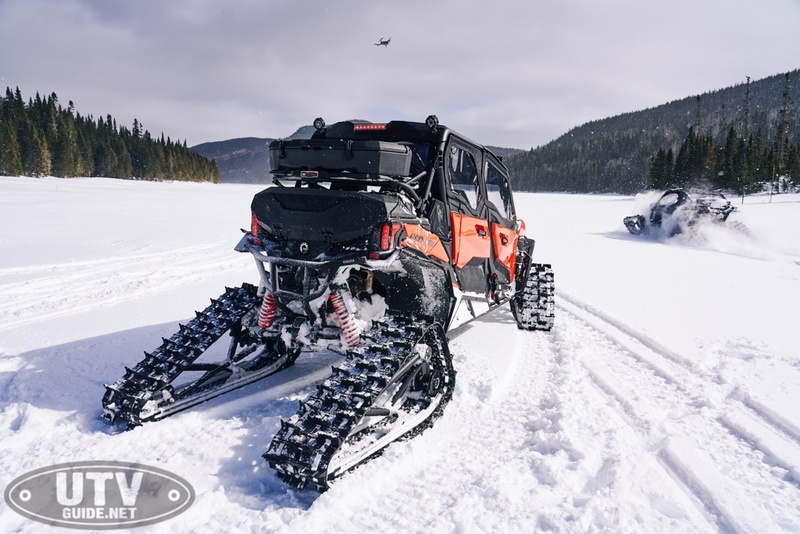 The first is flotation and the large footprint of the 146-inch track gives big vehicles like the Maverick X3 and Defender great flotation in the snow even though they are incredibly heavy. The next is Ground clearance and the Apache Back Country and Back Country LT tracks yield an amazing 7 inches of additional ground clearance. If you are going to climb into and back out of deep wooded terrain where the snow drifts are over some houses you will need uncompromised traction. The 2-inch lugs and wide stance in combination with the length of the Apache back country track provide all you will need. Finally, you need power. The Rotax power of the Can-Am Maverick Xds and Xrs as well as the Can-Am Defender HD10 give you plenty of momentum to drive off into the wild without hesitation or compromise. As with any Can-Am product these tracks are not just a stand-alone unit as Can-Am has developed a DPS module as well. This module corrects speed as well the odometer and it adds maximum performance for the Dynamic Power Steering on your SXS. As you can imagine these large tracks will need turning assistance but of course Can-Am has already taken this into consideration. This unit simply plugs into the existing harness under the dash for ease of use. With a few checks before takeoff like ensuring the digital readout for DPS indicates “Track Mode” as well as the differential lock is on you are ready to tackle the snow mountains. hey look so aggressive and really angry as you watch them drive by at speed in the snow. It is also amazing to watch such a heavy vehicle simply skip through the deep powder without any effort. Having been my first trip into any real deep snow I realized just how well the machine floats as I stepped out of the Maverick X3 and sank up to my thighs in the deep stuff. Typically, you would almost fall down into the cab of the Maverick, but here, sometimes you had to climb up into it. It is very apparent that the tracks perform to their expected duties as the overall footprint spreads the weight out well. Forward traction is abundant and the torque of the big Rotax mill generates the momentum needed to get the rig moving without any trouble. Obviously, the tracks do take more energy to move and the power is a bit less responsive but when the turbo spools the Maverick X3 does not disappoint. I think the most difficult thing about riding in the snow with a track system this large and outside the fender area is just how much of the powder ends up on the windshield of the vehicle when turning. The Can-Am accessory cab and windshield did keep it off of us (which was wonderful) and the wiper gave us a general view of the trail ahead, but it was very clear that we had to slow down before turning in any direction. The turning radius is also dramatically increased but that is to be expected as well.